Chak De Phatte.. on the Essendon football field! There is no doubt that Indians love their cricket, but football is undoubtedly becoming more and more popular in the community. 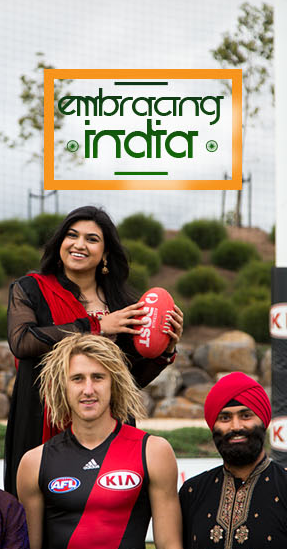 And now Essendon Football Club has launched its Embracing India initiative, where Indian fans of AFL (Australian Football League) can watch Essendon Football Club’s Sunday afternoon game against the Western Sydney Bulldogs with Punjabi commentary. Held on Sunday 2nd August, fans can log onto the official Essendon Football Club website and tune into the live commentary. The SBS Punjabi announcers speaking live on air are Harbir Kang, Charnamat Singh and Amandeep Singh. ps Bollywood star Bobby Deol has been spotted down at the stadium, joining the SBS announcing team behind the microphones to deliver some captivating commentary during the game. August 1, 2015 in Sport.